“It was nice to see a packed Walmley Social Club for this year’s event, although ticket numbers were limited, for the second year running they went like hot cakes. The atmosphere created from start to finish by the cheering and applause for all our winners made it one of the best nights we have had for some years. This year we had to replace the trophies for the Clare Fancote Awards and we invited two former recipients of this award to make this year’s presentations. Our female presenter was Emily Hathaway who was a club member from 1991 to 2003, winning many medals and championships for 8oo metres and Cross Country. Frederic Tremblay received his award in 2014 for a number of successful appearances for his native France at World and European Track and Field Championships both Indoors and Outdoors. 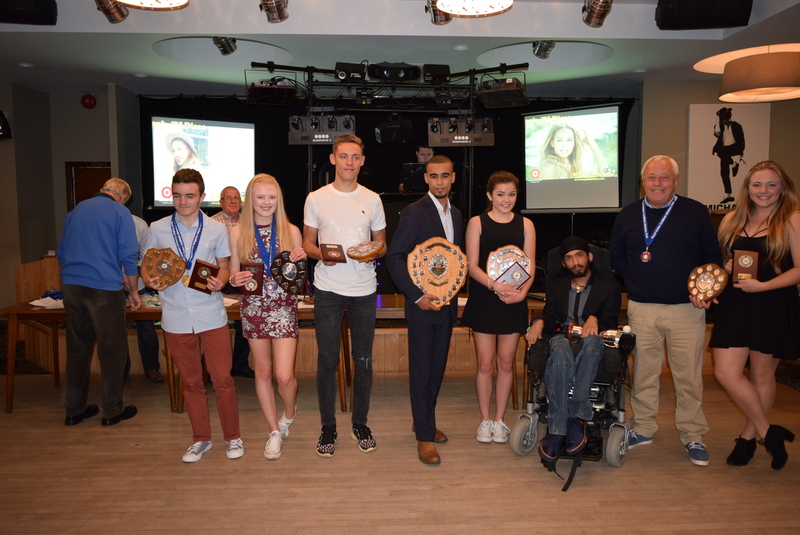 The prestigious Clare Fancote Awards are second only to the Club Person of the Year Award. The club also awarded a Life Membership to Ruth Dobbins for her services as a timekeeper, not only to the club but to athletics in general. Ruth joined the club in August 1998 along with some friends and work colleagues with the intention of running the London Marathon to raise money for the John Taylor Hospice and was coached by Gordon Chapman. I’m not sure whether the marathon was completed but I understand one or more half marathons were. In the year 2000 Ruth took a Time Keeper’s course and I think from then on running took a bit of a back seat. She has consistently supported the club both home and away and in particular the Young Athlete’s Track and Field League, often being asked at away meetings if she would take on the role of Chief Timekeeper. Having regular support such as this is very important because a lack of qualified officials can mean the loss of points from the team’s final score. Ruth is now a Grade 2c and officiates more often than not as a ‘Chief’ at Club, County and Midland Counties Events. She can also be found at many major meetings working as a Backroom Official. The club is very proud to award a Life Membership to Ruth Dobbins. I think many of the parents that are regular visitors to the clubhouse will have noticed the influx of new members, especially youngsters. This puts extra pressure on the daily and long term running of the club. All Coaches, Club Officers and Committee Members are volunteers and we are always looking for more volunteers to help at the club. You may have skills that could be useful to the club or you may have a particular job in mind that you would like to volunteer for. It could be serving at the coffee bar, raking a sandpit, collecting training fees, writing press releases, social media management, assisting a coach, these are just a few of many possibilities. Your club depends on volunteers, as little as 2 hours a week or 2 hours a month would make a difference at the club – whatever spare time you think you may have, we could really use. If you’re interested come and have a chat in the Clubhouse – ask any questions, tell us what skills you have and fill in a contact form and we will be in touch. Alternatively, you can contact us through the website, as normal. Who is the old fella second from the right standing next to Chrissie Prince ?